The WWA students and staff had a wonderful time hosting 44 neighbors at the Eighth Annual WWA Neighborhood Read on Friday, April 21, 2017. Guests helped WWA kick-off College Awareness Week by sharing information on their professions with our students. Students learned about many different career opportunities available to them. We were joined by a geologist, accountant, marketing director, educator, senator, physical therapist, professor, author, architect, human resources specialist and several other professionals. Each neighbor also read a book of their choice with the students and then switched roles as students read some of their writing with the guests. We are in Week #4 of We All Read! 2017, our all-school/all-family reading program. We have had much fun with our mascot, Ralph, at school. Although we have a space for him in the library, he has chosen to get on his motorcycle and explore the school building. Ralph even left wheel marks on the hallway floors! This week families should finish reading The Mouse and the Motorcycle, by Beverly Cleary and enjoy the Family Activities. There is even a board game for you to play together. Feel free to help your student complete the Vocabulary Puzzle. Students who turn in all four weeks of Vocabulary Puzzles on time will win a prize! Please plan to join us on Wednesday, March 29, 2017 at 10:30 a.m. for our Celebration Assembly and Spring Concert. Third, fourth, and fifth grade students will present a musical adaptation of The Mouse and the Motorcycle. share how involved parents impact their success! To empower students to fulfill their promise. 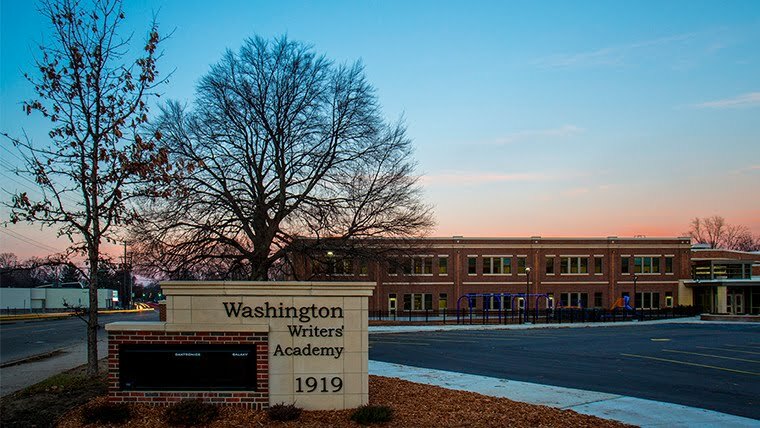 Washington Writers’ Academy is a fully functioning Professional Learning Community that ensures high student achievement for all.